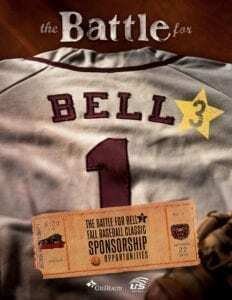 Join us for the 3rd annual Battle for Bell to benefit the ALS Clinic at CoxHealth. This baseball game honors the late Glendale coach Howard Bell whose courage in fighting his disease inspired generations of young people. Now his legacy is in helping others through this game. Missouri State University takes on Drury University in a baseball match up you will only witness at this event. Join us September 22nd at the US Baseball Park in Ozark (formerly the Ducks Park/Price Cutter Park). Gates open at 4 PM so you can enter early and enjoy all the fun. There will be games and activities for the kids and a chance to see your team’s batting practice. The game starts at 6 PM. Silent auction items will be on display with an opportunity to be the high bidder on some exciting baseball packages. Tickets & Meal – $12 includes your admission and a meal package: hot dog or burger, drink, chips and ice cream. Online ticket sales have concluded. Print out your confirmation after payment on this site and bring it to the gate. Your tickets will be at the CoxHealth Will Call. ALS or Lou Gehrig’s disease is a neuromuscular disease that has no cure. The CoxHealth ALS Clinic is dedicated to helping patients have a higher quality of life and more time with their families through a continuum of care. This clinic has been made possible in part from the family and friends of Howard Bell who are committed to ensuring all ALS patients have the resources they need locally for their care.